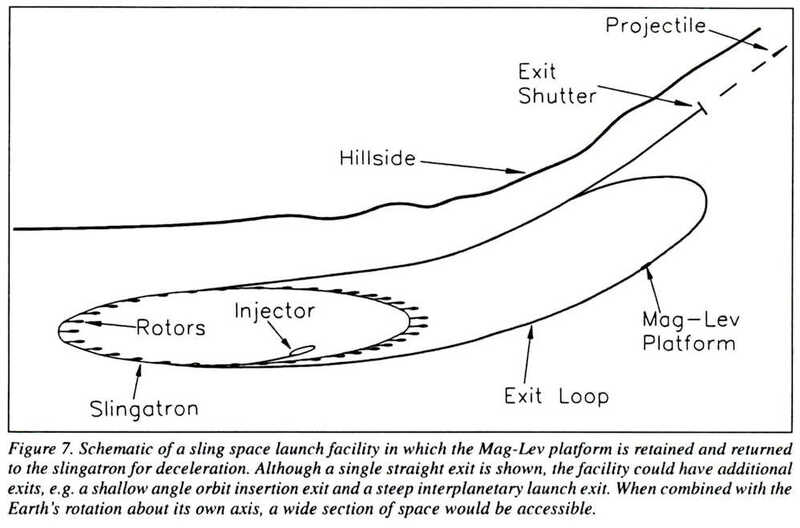 Sling Launch of Materials into Space by Derek Tidman, beginning on this page, describes the mass launch concept, “slingatron.” The slingatron uses a coriolis wave to slowly accelerate a magnetically levitated projectile around a circular path in a long tube guide. It defies the velocity limitations of conventional slings and has the potential for launching large amounts of mass into Earth-orbit or interplanetary space at a relatively low cost, and without polluting the atmosphere. Power from Space: The Imperatives of Commercialization by Mary Woodell builds the case that in order for solar power satellites and wireless power transmission to be commercially successful, not only must the technical consideration of both technologies be considered, but the market demand of each must be considered. Ms. Woodell discusses the components of market demand (need, safety, benefits, value and means), the understanding of technical feasibility, and the acceptance of functional safety in relation to the potential commercial success of the technologies. Page 7. Humble Space Telescope by Michael Martin-Smith tells us of a proposed venture for a small satellite telescope in England. Page 6. Jay Thomas, SSI’s intern is honored on page 11. With the help of Senior Associate Robert Lentz (lentz@rossi.astro.nwu.edu) SSI has set up a World Wide Web home page. To connect, open a web browser (like Lynx, Mosaic, or Netscape), choose “Open URL” or “Open Location” from a menu or list of commands. Then enter “http://www.astro.nwu.edu/lentz/space/ssi” and press return. Within a few seconds, you will connect to SSI’s Home Page, from which you can get information about SSI, or connect to other related sites. If you have difficulty with these instructions, contact your service provider, since there are many different methods of connecting. If this doesn’t work, send us a note, and one of our staff will help you. 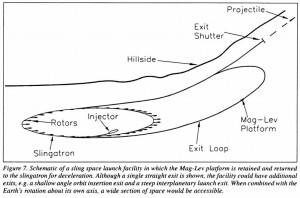 A mass launch concept, called a slingatron, is described in which a coriolis wave can be used to slowly accelerate a magnetically levitated projectile around a circular path in a long guide tube. The guide tube is evacuated and cryogenically cooled using LN2 so that the projectile circles around the accelerator with a very small EM friction coefficient decreasing as velocity V-1/2. The tube structure is simple, contains no coils, and has a liner of normal conductivity material. The slingatron appears capable of smoothly accelerating masses ranging from small values to tons to velocities ranging to above 10 km/sand possibly to above 30 km/s. It has the potential for cumulatively launching enormous amounts of mass into Earth orbit, with final orbit insertion being accomplished with a small rocket kick at apogee. Innovatively structured payloads able to tolerate the typical perpendicular accelerations of ~103 gs could also be launched. A circular accelerator approach to hyper velocity mass launch was recently proposed1,2 that uses the same acceleration principle as that of a sling, but without the velocity limitations of conventional slings. Magnetic levitation of the projectile is used to provide the needed low friction coefficient as it accelerates through the accelerator tube. 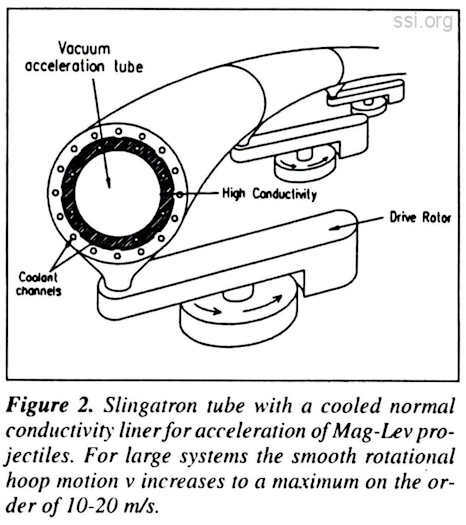 Here we summarize the slingatron concept and extend the discussion of magnetic levitation to include the use of cooled normal conductors on the projectile as an alternative to superconductors. Normal conductors can be used for a range of cases and would simplify the engineering. The potential role of the slingatron as a space launcher is discussed and a specific example of such a launcher is given. 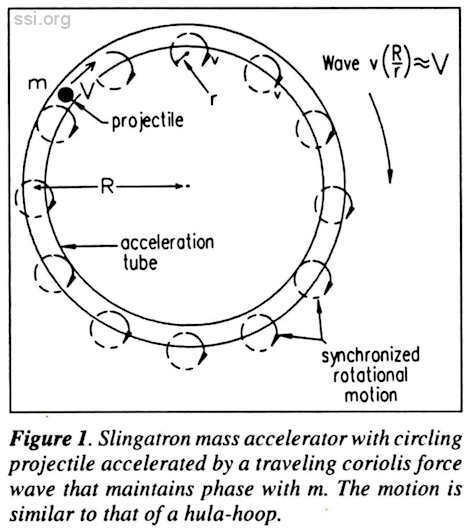 The accelerator makes use of a closed evacuated tube that guides the projectile of mass m and velocity V around a circular path of radius R (Fig. 1). The projectile is accelerated by a coriolis force that is generated by driving a smooth low-speed circular displacement motion of the entire accelerator tube by using rotary drive machinery distributed around the circular path. The device is similar to a giant hula-hoop. The synchronized drive rotors are phased relative to the projectile location (using input from projectile detectors around the trace or preprogramming), so that the rotors are continually pulling the guide ­tube inward along its radius at the projectile location. The dynamics is similar to that of a conventional sling, but without the cord tensile strength problem that limits conventional slings to well below 1 km/s. where g⊥=V2/R, and α and F|| are the friction coefficient and drag force. Although the acceleration g|| << g⊥. is small, it can be sufficient over a time ranging from many seconds to several 10’s of minutes for large systems, to reach extremely high velocity. Further, the required power levels are low (compared with guns) and conventional electric motors can be used to drive the rotors. Energy is efficiently pumped into the projectile since the kinetic energy invested in the hula-hoop motion ofthe track is substantially less than the projectile energy, although the track momentum dominates. The radius R of the accelerator path could range up to many kilometers depending on the velocity and mass objectives of the system, and r would be limited to several meters for mechanical reasons. The ratio of the coriolis force to the frictional drag force on the projectile follows from (1) as r/Raα. A small friction coefficient is necessary so that α<r/R<<1. Magnetic levitation appears to be the most attractive means for obtaining a suitably small friction coefficient. The normal conductivity tube liner behaves like a diamagnetic medium when levitating magnetic flux (originating from the accelerated mass) sweeps over it at high velocity. The friction coefficient in this case derives principally from the ohmic resistance to eddy currents in the tube liner, and decreases as V-1/2 for V> several 10’s of m/sec for systems of present interest. 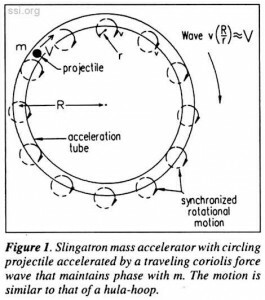 The slingatron accelerator, which combines a coriolis force acceleration with magnetic levitation, appears capable of slowly accelerating large masses (tons) to above 10 km/sec and possibly to above 30 km/sec. The EM friction coefficient can also be reduced by cooling the normal conductivity tract, as shown in Fig. 2. 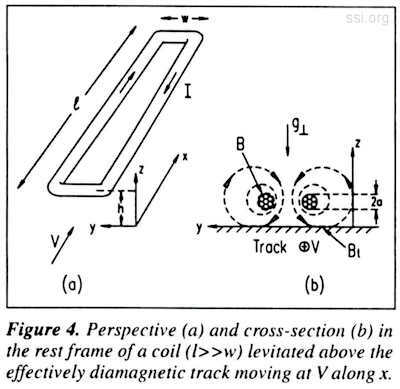 Note that r/R is chosen to be <(R/r)v.
In order to provide the magnetic field needed for levitation (e.g., a 10 Tesla field can provide 400 bars of support pressure), it is preferable to locate coils on the mass being accelerated. This mass may consist of a projectile supported by a levitated platform of superconducting 1,2,3 or normal conducting coils as shown in Fig. 3. This has the advantage that the long slingatron tube can have a simple structure that is free of coils as shown in Fig. 2. Figure 3 shows a payload to be launched that is carried by a platform of coils of normal conductivity that are energized by a power supply consisting for example of batteries. These components and connecting structures together comprise the mass that is levitated inside the slingatron tube and accelerated. The Mag-Lev platform would be recovered for re­use. The power supply provides a current that increases as V(t) increases during acceleration. We assume that the coil current I(t) is increased so that the levitation height h above the sling tube bore remains approximately constant. Note that the peak current is needed for only a short time, for example a couple of minutes for the large systems considered here. The coils are pre-cooled to a low temperature to increase their electrical conductivity, and are contained cryogenically to provide some additional cooling during operation. This serves to minimize their ohmic heating during the acceleration process so that the power supply can be small. Note that the inductive energy stored in the magnetic field required for levitation is also relatively small. 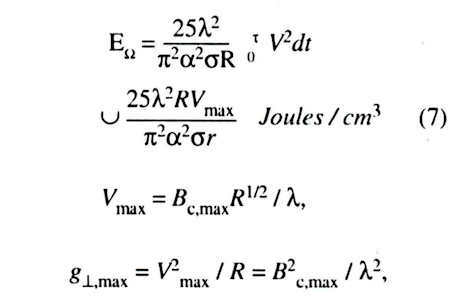 For example, a field energy density B2/8π of 1 kilobar corresponds to 100 Joules/cm3, which is small compared to the energy density of a few kJ/cm3 that could be stored in the batteries of a power supply unit. where ρc is the density of the coil. where the variables are in cgs units, σ in Ω­1cm-1, and B in gauss. These for ulas are approximate in that the ends of the elongated racetrack coil were neglected and the track was assumed to be perfectly diagmagnetic, which is a condition approached at high velocity for which the skin depth is <<h. Provided the ohmic power density dEΩ/dt and total energy density EΩ can be removed by relatively small amounts of cryogenic cooling, it becomes practical to make use of normal conductivity coils as discussed in this section. For cases in which the coil temperature increase cannot be easily kept small, super­conducting coils3 become necessary. In this section we choose parameters for a large scale slingatron that can be viewed as a candidate for ground-to-space mass launch. The levitation coil geometry is assumed to be a single thick elongated racetrack coil of copper windings as shown in Figs. 3 and 4. Although this simple coil structure has the merit of simplicity for obtaining estimates, it does not give the optimum levitation force per unit mass, and multiple coils of smaller size are expected to be better. Also note that we could use Al instead of the Cu for the coils which would make the Mag-Lev platform a smaller fraction of the total mass. The numbers in this section are thus viewed as conservative. 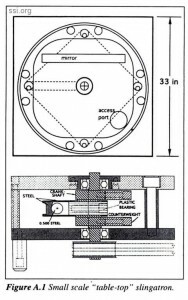 For the racetrack coil dimensions (Fig. 4) we choose w=90cm, h=22.5cm, a= l5cm, 1=800cm, and density for copper, ρc=8.96 gm/cm3. The coil mass me is thus approximately 10 tons. The levitation clearance between the base of the coil and the track is 7.5 cm of which 2.5 cm may comprise the container and skid structure. The total accelerated mass consisting of the Mag-Lev platform plus the projectile to be launched is assumed to be m=5mc=50 tons. Of this, the projectile mass is assumed to be 25 tons, and the Mag-Lev platform components consisting of the coil, cryogenic containers, power supply, mechanical connecting structures, and skid, make up the remaining 25 tons. Note from Equation 1 that for the mass m to be accelerated we require an initial minimum speed V0 so that the coriolis accelerating force exceeds the EM drag. Using2, αEM=(4c2/π2σ/V)1/2 r/R, the condition is V0 (startup) > 1.27σ-1 (µΩ cm) km/sec. For example, cooling an Al-lined track to 80°K (Fig. 2) using LN2 would give4 σ-1 (Al, 80°K) = 0.25 µΩ cm, from which the initial minimum injection speed follows as V0>317 m/sec. This minimum injection speed could be reduced considerably by cooling the track to a lower temperature. However, it is more desirable to use a small injector sling (e.g. Rinj ~ 100 m) as discussed in Ref. 1. 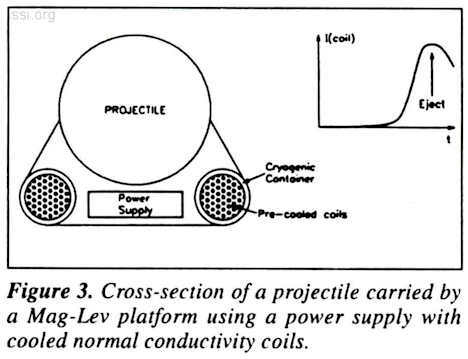 This has the advantages that (i) LN2 cooling can be used to reach 800K for the entire hoop liner system, (ii) an injector sling that could inject at 1 km/sec would reduce the total acceleration time, which in turn reduces the mass of the levitation power supply, and (iii) injection into the small sling could be at a very low velocity of ~10 m/sec since the coriolis force is relatively stronger due to the larger ratio r/R. In addition we must check the Mag-Lev coil ohmic heating to determine if normal conductivity Cu windings can be used. Using (4) and (7) with the large slingatron example of this section, we find that if the coils are pre­cooled to 25°K, for which σ-1=2.5×10-9 Ωcm, the total ohmic energy density that must be removed during acceleration to keep the coils at 25°K is 180 Joules/cm3. If the coils are initially at 15°K, for which the resistivity4 of ideally pure Cu is 10-10 Ωcm, the total ohmic den­sity to remove is 7 Joules/cm3. Noting that for normal H2 at 1 bar, T(freeze) = 14 K, T(boil) = 20.4 k, ρliquid=0.07 gm/cm3, and heat of vaporization4 = 31 Joules/cm3, it appears that LH2 could be used to achieve the above cryogenic conditions and with a small boil-off, to maintain them during acceleration. Note, we also chose the wire bundle self-field Bc in (4) to be 158 kG at the final velocity of 8 km/s. The total field would exceed this in some regions since it derives from both sides of the coil and the image coil track. Slingatron hoop mass and construction are primarily determined by a structural dynamics requirement that the large localized load caused by centrifugal force at the instantaneous projectile location must not cause excessive hoop deflections. This problem is similar to that of a railroad locomotive crossing a bridge. In the slingatron, however, the supports for the track are the rotor arms, which primarily experience bending instead of compression as in the bridge example. The time-dependent stress and strain behavior of the sling tube, rotors and support structure must be solved numerically, and is beyond the scope of this paper. An additional requirement on the entire rotating mass is that of dynamic balancing. Figure 5 shows the sling tube symmetrically supported by two equal counterweighted rotors, supported by a massive arch. For clarity, the rotors are depicted 90 degrees out of the position they would normally occupy at passage of the projectile. The clutch prevents high impulsive loads from the projectile from passing through to the gearbox. The motor RPM is controlled from a central computed to facilitate tube acceleration, and to make up for clutch slippage. Liquid nitrogen must also be fed to the sling tube through the rotor arms, by way of rotary joints at the rotor tips. The vacuum pumps could, for example, be mounted on the sling tube. There are also issues involving the Mag­Lev platform design. The platform could be constructed out of strong lightweight materials, use cooled Al coils, and be designed to have a larger area of magnetic field support pressure than the side area of the projectile that it carries. This would increase the levitation force available for carrying the projectile. It may also be necessary to consider the use of a guide rail to damp oscillations of the Mag-Lev platform as it accelerates around the sling tube. For some slingatron designs one could also consider using the sling tube as an EM waveguide for the transmission of power to the Mag-Lev platform, thus reducing the mass of the platform power system components. Mechanical issues are important, since it may be possible to accelerate substantially larger masses than the 50 tons to 8 km/sec example given above, without much increase in R. For this example, the hoop kinetic energy (including rotors and counterweights) is estimated to be less than the kinetic energy of the 50 ton hypervelocity mass. This interesting inequality appears to apply for a wide range of slingatrons, and in the Appendix, a design for a small table-top slingatron is described for which it also applies. Figure 6 shows a comparison between an equivalent linear EM accelerator of length L and a circular slingatron accelerator of hoop radius R. It is assumed that both accelerators launch a projectile of mass m to velocity V, and that the average levitation pressure B2/8π for the slingatron at peak velocity is the same as the ideally constant accelerating base pressure in the linear case. Since Aside(B2/8π) in the circular machine, and L=mV2/2Abase(B2/π) in the linear machine, we see that L = (Aside/Abase)R/2~2πR since typically the side-­to-base area of the projectile is -10 for projectiles designed to traverse the atmosphere with small drag loss. Both areas would be comparably increased if area-enhancing sabots were used, so we will not complicate the discussion by considering them here. 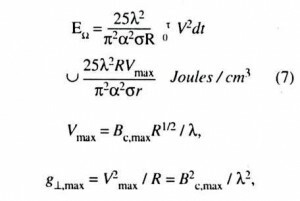 Note that for an EM gun, compression forces from acceleration that cause the stress distribution in the projectile go from B2/8π on the projectile base to zero on its nose, and from B2/8π along the supported side of the projectile to zero on its opposite side for the sling. 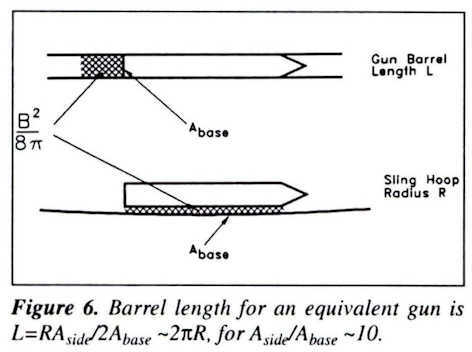 Although the resulting (assumed constant) acceleration in the gun is smaller by Abase/Aside than the final peak centrifugal acceleration in the sling, it is not practical to increase B2/8π in the gun beyond that in the sling in order to reduce L, since this pressure is assumed to be already in the kilobar range. For over a decade, starting about 1980, EM gun R&D was well funded but encountered difficulties. 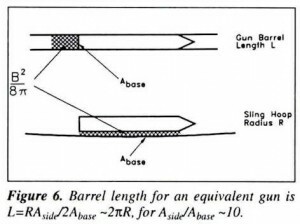 For railguns, the plasma part of the armature grows axially as arc breakdown occurs in the hot ablated vapor trail (which includes metal atoms) left in the low pressure region swept out behind the projectile5,6. This results in decoupling of the propulsive Lorentz force from the projectile as an increasing fraction of the current fails to keep up with the projectile, which to date has limited railgun velocities to about 6 km/sec. Railguns are also low impedance devices and for very large projectile masses and long barrels they require extremely large pulsed power supplies distributed along the rail and switched rapidly into the rail sections behind the projectile. To date this has proved to be a difficult technology. For coilguns, the field impulses for sequentially switched coils cause impulsive stresses on the projectile. Also, as the projectile velocity increases, the voltage needed to bring the magnetic field up to full strength in the coils during the shrinking transit time through the coils typically exceeds 1OOkV beyond a few km/sec. As for railguns, the rapid switching of energy into the gun from large distributed power supplies is a difficult technology. To date the velocity performance of EM guns is still below that of the decades-old two-stage light gas gun technology. 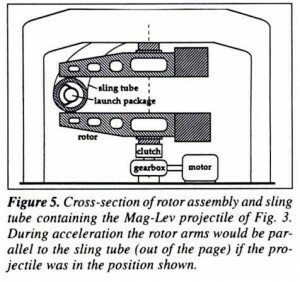 The sling appears to be a simpler technology in that it involves much lower quasi-CW power levels, a smooth acceleration, a supporting Mag-Lev field that is steady, and an accelerating force that cannot fall back from the projectile since its wave velocity (R/r)v is mechanically designed into the system and couples to the inertial mass of the projectile. Figure 7 shows a concept for a space launch system. The slingatron is located in a horizontal plane and slowly brings the total mass (projectile plus Mag-Lev platform) up to speed. For the example considered here, this would be a launched projectile of mass 25 tons at 8 km/sec, with a reusable Mag-Lev platform of 25 tons. The slingatron hoop radius would be 4 km, maximum centrifugal acceleration 1600 gs, and the maximum roter speed 16 m/sec. The design of the Mag-Lev platform was not optimized and could also be made lighter by using Al coils instead of Cu. Once the mass has achieved 8 km/sec inside the slingatron, the entire package is shunted into an exit tube loop, e.g., by the method discussed in Reference 1. The exit loop curves the Mag-Lev projectile path up a hill (Fig. 7), and when pointed at the correct launch angle, the projectile is detached and flies freely down a straight section at the end of which a vacuum shutter is opened to allow launch through the atmosphere. The Mag-Lev platform coils serve to confine the platform from “above” in the main loop during this detachment (Fig. 8) as complete separation is accomplished by curving the main loop away from the straight exit section. 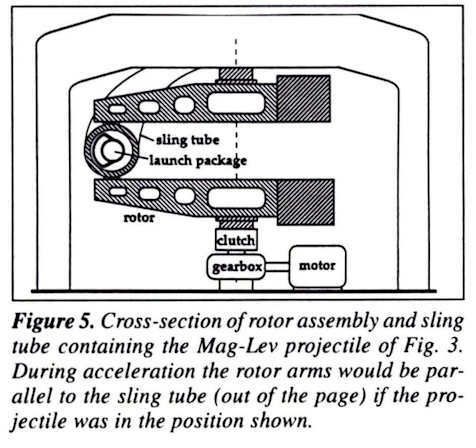 The Mag-Lev platform then passes around the loop and is reinserted into the slingatron where the rotors are phased to bring it slowly to rest. Note that the entire exit loop is a simple anchored guide tube in this scenario, with a conducting liner at normal temperature. It involves no cooling and no distributed rotors, and the centrifugal force generated by built ­in curvature of its path serves to separate the projectile from its platform without any moving parts along the exit loop. 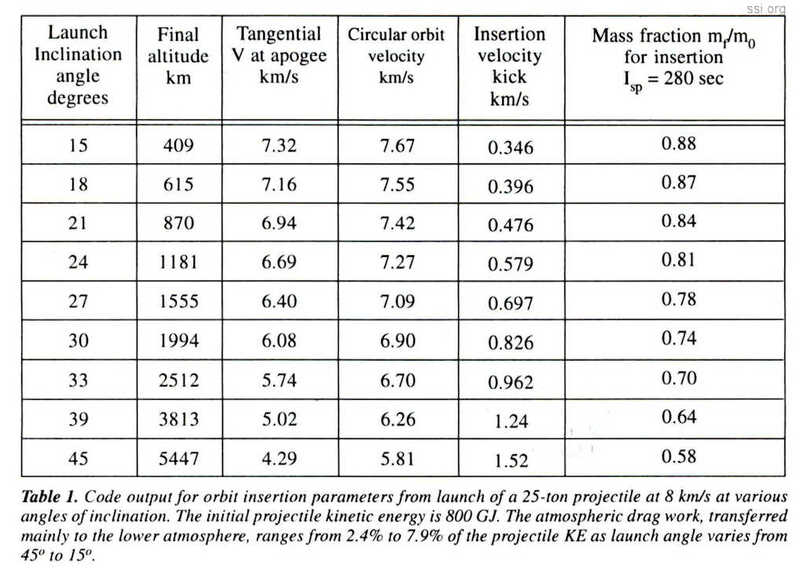 Depending on the launch angle, the 25-ton projectile could be inserted into a circular Earth orbit at apogee with a relatively small rocket kick (Table 1). The sling projectile trajectory was calculated with a simplified model of the flight dynamics and orbital dynamics. The code assumes sea-level launch to the East with an initial velocity of 8000 m/s at a launch angle of 15 to 45 degrees from the horizontal, and integrates along the flight path to the maximum altitude point. The simulation accounts for the variation of radial gravity with altitude, wave and friction drag on the projectile, and assumes a standard atmospheric profile for density and temperature to a maximum height of 40 km. Earth’s rotation contributes 204 m/s (at 28.3 degrees latitude) to the initial tangential velocity, and the wave drag coefficient for the slightly blunted conical nose projectile varies from CD =0.04 to 0.03. A constant skin friction coefficient of 0.001 is assumed, and projectile ablation is neglected. At maximum altitude, an impulsive circularizing bum at a specific impulse of 280 sec completes the orbital insertion maneuver. (i) It requires relatively low power input drive units and, for large systems, these units can take several 10’s of minutes to smoothly pump kinetic energy into the projectile. Its power requirements could thus be provided by conventional electrical quasi-CW sources, for example generated by hydroelectric, solar, gas­ turbine, nuclear, or other power sources. 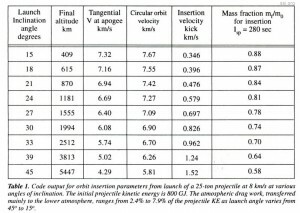 (ii) A large fraction of the mass launched from the Earth’s surface consists of payload, so that the launch cost per kg in orbit is expected to be substantially less than for rockets. The slingatron is efficient since the EM friction coefficient decreases as V-1/2, and the kinetic energy of the accelerator hula-hoop motion is less than that of the projectile. (iii) No propellant gases are generated in the mass accelerator or in transit of the atmosphere, so that the environmental impact on the atmosphere would be small. (iv) Because the accelerating mass in the sling is levitated above the bore, it avoids hypervelocity sliding contact with the tube liner, so that the inner liner surface does not require high quality smoothness. This contrasts with hypervelocity EM and light gas guns in which sliding contact causes ablation and gouging of the barrel, which requires rehoning to re-establish a mirror finish after a number of shots. Note that if levitation is lost in the slingatron due to a power system failure on the Mag-Lev platform, the accelerating mass could be directed out of the machine with a single sliding traversal of a tube section to the nearest exit as discussed in Ref. 1. (v) Extremely high velocity appears to be achievable, above that achieved to date by guns or rockets. The propulsive force is proportional to the projectile inertial mass, and is mechanically designed so that the coriolis wave has no problem keeping up with the projectile. This may make the sling an attractive system in the future for rapid transport of packages between the Earth, Moon and Mars for example. Although cryogenic cooling is required, LN2 would suffice to cool the normal conductivity liner of the accelerator tube for a space launcher, and LH2 for the normal conductivity Mag-Lev projectile coils. The slingatron is capable, in principle, of launching an enormous mass to LEO each year with low environmental impact. At 25 tons per shot and at launch intervals of 90 minutes, a single launcher could put approximately 146,000 tons or 320×106 lbs into orbit each year. This would be equivalent to launching a fully loaded shuttle every 90 minutes, 24 hours a day, 365 days a year, namely about 6000 launches per year. Even if large new heavy­lift boosters were to be developed, the number of yearly launches would still be in the hundreds. The potential environmental consequences of launching this much mass to LEO each year using chemical rockets is not well understood but appears to be an issue of some significance. Present day rockets such as the Shuttle and many expendables rely heavily on the use of solid rockets for all or part of their boost. Such rockets typically produce copious quantities of HC, NOx, and Al2O3 with known and undesirable local and global environmental effects. The HCl reacts with OH in the stratosphere to produce free Cl which is an active ozone destroying species. McDonald, et al.7 point out that 36 Shuttle and 24 Titan launches per year would contribute about 1% of the global stratospheric Cl produced by all other sources including natural. This becomes a significant burden at the much higher launch rates considered above, and it becomes clear that it would not be desirable (nor practical) to launch the above quantities of mass-to-orbit using solid rockets. Future advanced reuseable or heavy-lift boosters may rely on LOX/LH2. Even in this case, though, the environmental effects cannot be neglected for extremely high launch rates. The main concern here is the unknown effect on ozone depletion due to the deposition directly into the stratosphere of large quantities of the potential ozone-destroyers H20, H2, and NOx. It appears that particulates in the stratosphere, such as ice crystals, may also act as catalysts for ozone depletion, and that the rate of catalysis depends on their total surface area per unit volume. Since there is very little turbulent mixing and flow in the stratosphere, water vapor deposited there in the form of ice tends to hang around for extended periods of time, with lifetimes on the order of years, depending on grain size. A small amount of NOx will also be generated indirectly by LOX/LH2 rockets due to the high temperatures involved. Although this is a negligible effect for low launch rates, it may become important at the much higher launch rates considered here. At any rate, this remains an open question at this time. In the early decades of the 21st century space industrialization may expand, including possibly the use of lunar resources, solar power generation in orbit, and the amassing of large amounts of fuel, water, and supplies in Earth orbit for manned Mars missions. In the same period, it is likely that the permissible levels of atmospheric inputs will be reduced, particularly if global warming and weather pattern changes become obvious and generate anxiety in the population. Although many questions remain unanswered regarding the long ­term environmental effects of “clean” chemical rockets at extremely high launch rates, it is clear that potentially harmful effects do exist. Slingatron offers a launch method which spews nothing into the atmosphere and so by­passes the issue. The work of D.A. Tidman, R.L. Burton and F.D. Witherspoon was supported by DATAassociates. 1. Tidman, D.A., “Sling Launch of a Mass using Superconducting Levitation,” IEEE Trans. Magnetics, submitted, Nov. 1994. 2. Tidman, D.A., “Slingatron Mass Accelerator,” Physical Review Letters, submitted, Jan. 1995. 3. 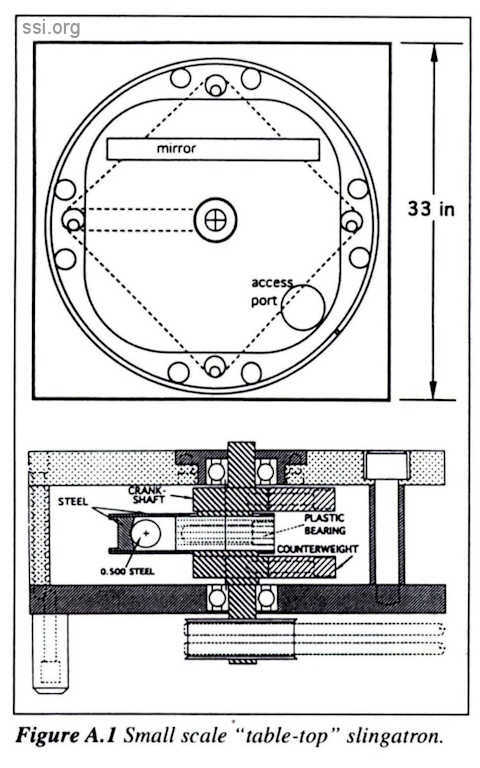 Moon, F.C., “Superconducting Levitation,” John Wiley & Sons, New York, 1994. 4. A Physicist’s Desk Reference, published by American Institute of Physics, 2nd Edition, 1989. 5. Parker, J.V., “Why Plasma Armatures Don’t Work (And What Can Be Done About It),” IEEE Trans. Magnetics, Vol 25, No. 1, Jan. 1989, pp. 418-424. 6. Tidman, D.A., Witherspoon, F.D., and Parker, J.V., “A Gas-Insulated Railgun,” IEEE Trans. on Plasma Science, Vol. 21, No. 6, Dec. 1993, pp. 784-785. 7. McDonald, A.J ., Bennett, R.R., Hinshaw, J.C., and Barnes, M.W., “Chemical Rockets and the Environment,” Aerospace America, Vol. 29, No. 5, May 1991, pp. 33-36. A tabletop version of the sling accelerator has been designed to verify the basic concept, and to test out control techniques (Fig. A.1). The projectile is a 1.27 cm diameter steel ball rolling in a shallow V-groove track, to a maximum speed of 50 m/s. The track radius R=36 cm and the gyration radius is r = 0.72 cm (R/r =50). The track is stiffened with steel webs, and is driven by four equally-spaced counter­weighted crankshafts, with ball main bearings. The “big-end” rod bearing is plastic to minimize the lubrication requirement. The crank­shafts are driven with timing belts by a central 250 watt DC motor, controlled to match rotational speed and phase angle with the ball. Ball startup is initiated by hand through the access port (Fig. A.1). A mirror allows viewing of the circulating ball. The track rotating mass is 4 kg and the ball is approximately 8 grams, or 1/500 of the track. The ball kinetic energy with R/r =V/v =50 is thus 5 times that of the track, even though we have not optimized the design of the track to minimize its mass. This relationship is expected to hold for both small and full-size systems. I thought it might be timely to update SSI Senior Associates on an exciting new venture underway this side of the Atlantic, in the run­up to the Millenium. In the past year England has inaugurated a National Lottery, which is now making available to its organizers nearly $3 billion per year. This is dispersed to a variety of good causes, ranging from opera houses, exhibition halls, local environmental projects and much else. Last year, the Millennium Fund Commissioners expressed disappointment at the lack of any serious or visionary ideas for science, so one of our leading national daily newspapers launched a competition for science projects to be funded out of $80 million that could be set aside for science in order to mark the Millennium. Accordingly, I submitted a plan for an amateur class, small Schmidt-Cassegrain telescope to be put into orbit, perhaps as a fill­in payload of opportunity on an Ariane rocket, which would be controlled from a national centre. The astronomical images, obtainable with perfect “seeing,” 24 hours per day, would be directed to school classrooms, TV science channels, and other interested parties, via the Internet, and would allow real access to the beauties, as well as the science, of the cos­mos, to the armchair explorer. Most of the equipment would come off the shelf, while the satellite bus can be built in England. Much to my surprise the idea attracted great interest, and, indeed, out of 1000 offerings, shared the prize of£100. It has been taken up by the Trustees of a proposed new National Science Centre, which I learn this week is to be built in Derby, subject to approval of a for­mal bid to the Millennium Commission in Jan/ Feb 1996. Since my Telescope (to be called the Humble Space Telescope) is a central “ex­hibit” in the new Centre, and put forward as such, acceptance of the bid – which at this time seems highly probable – implies approval for Humble. A feasibility study is to be carried out shortly afterwards by Professor Martin Sweeting, of Small Satellite Technologies Ltd.
SSTL has built and has launched 11 small satellites to date, recently with the active en­couragement of ESA, and is very keen to become involved with our project, subject to funding. His first satellite was planned and built at a cost of less that $150,000 – no mean achievement in itself. Informally he sees no “show-stoppers” to the Humble concept, so that we already have a project manager in Dr. Rodney Buckland, of the Open University and Brunel University Space summer school, a potential engineering team, and, with the re­cent interest of the European Association of Astronomical Education, backed by the EU, a good chance of a free launch on the Ariane in late 1999. On top of all this, I have the support of a retired professional astronomer, who is anxious to help us with platform stabilization and instrumentation, as well as adding a couple of small telescopes to the “bus” to carry out long-term light curve studies on Sun-like stars. He has shown that remarkably small variations in light can be teased out from background noise if a 4-6 week period of continual observation can be achieved – something not possible on professional observatories. As a real bonus, he suggests that the discovery of Earth­sized extra-solar planets could result. All of which means that, as well as being an educational asset for astronomy, image capture and processing, satellite control and project management, real science could be done as well! For my part, I hope, in the event of success, to achieve a degree of recognition in England, which I would use to promote my own book “Man, Medicine and Space,” and also to publicise the ideas and programmes of the Space Studies Institute. Senior Principal, Bivings Woodell, Inc.
Commercialization of any new technology requires fulfilling three criteria: technical feasibility, functional safety, and market demand. Experts generally agree that using microwave technology in space to generate power is feasible, and most believe it to be safe, although longitudinal exposure data do not yet exist. Where expert consensus breaks down is with regard to market demand, concerning which opinion varies and available data are soft to the point of insignificance. Given the traditional focus of scientific research and development, it is not surprising that marketplace issues command a lesser priority than those of the research lab. However, lack of understanding of market demand creates an insuperable barrier to successful commercialization. The technical community, having satisfied itself of feasibility, must move on: to confirming fundamental safety, and, at the same time, to dealing aggressively with market issues. This paper focuses on the market for power from space as an alternative source ofenergy. It seeks to raise basic questions and to challenge the technical community to make the leap from theory to practice. The question of market demand is in many respects unexplored territory for the scientific and technical community, especially for that segment engaged in so-called “pure” research. Both by training and by temperament, scientific experts who focus on furthering knowledge and expanding the limits of feasibility often do so to the exclusion of commercial consideration. What many of these experts fail to realize is that even the most rarefied scientific research is, ultimately, market-driven. Funding, whether commercial, academic, or governmental, reflects market demand – the priorities of the people who pay. And increasingly, funding depends on practical application – actual or potential. It is beyond the scope of this paper to weigh in on the debate about the value and the future of basic science. However, the fact of that debate cannot be overlooked because it is a key factor in any consideration of commercialization of technology. And, in fact, the context it creates is, in the author’s opinion, essentially more favorable to the prospects of power from space than a casual observer might suspect. Market demand for any new product, method, or technology will determine its commercial potential. However, demand itself is a relatively complex function, deriving from a number of factors – some of which vary according to the “product” in question. And markets themselves are always in flux, reflecting constant demographic, societal, political, and economic change. In short, then, the whole concept of “market demand” is a moving target, not a static goal. Even so, there are some essential characteristics of market demand that apply consistently. While the specifics may fluctuate, it is safe to say that no product, service, or technology will find a market unless people know about it, want it, trust it, and can pay for it. Need — Actual and Perceived. The need being fulfilled can range from the essential to the fanciful, from the very tangible to the highly emotional. Wherever they fall on this kind of spectra, commercial products and technologies must address a consumer need. Moreover, the consumer must perceive and experience that need in order to act on it. In short, people must want something as well as simply need it, before they will demand it. Safety — Actual and Perceived. The demonstrable safety of a new product or process is fundamental to successful commercialization. Few people will accept, much less demand, a new product or process they know ­ or believe – to be unsafe. Benefits — Actual and Perceived. In addition to direct benefits (i.e., fulfillment ofa specific need), more general benefits of a given product or technology strongly influence market demand. Such benefits, often long-range, may be societal, economic, or environmental, and contribute to overall desirability. Value — Actual and Perceived. Value can be seen as the net of actual cost and perceived benefit. Cost-efficiency is an important factor in consumer decisions, especially when a range of alternatives exists. Means — Regardless of how urgently people may need, want, or demand something, the ability to get it depends on whether or not they can pay for it. “Payment” may be literal and direct (as in a consumer products purchase) or indirect, e.g., via centralized funding decisions that reflect public demand. Either way, a market without means is not a market at all. 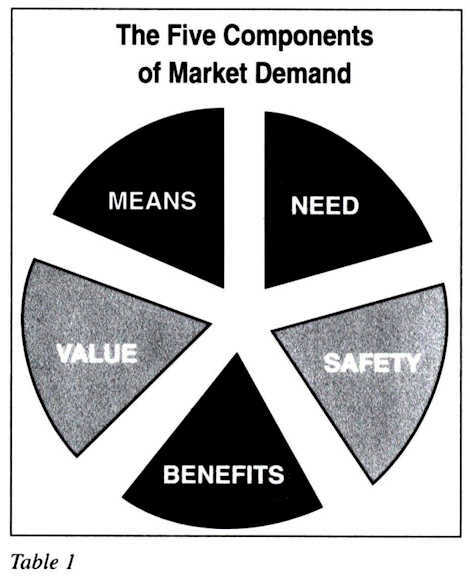 These five basic components of market demand – need, safety, benefits, value, and means – pose numerous challenges when applied to the development and commercialization of alternative energy sources. The technical community has addressed aspects of each of them, but appears to have done so in a somewhat haphazard manner, without the discipline and focus that characterizes other dimensions of its work. For example, assumptions are often made about public perception and consumer behavior without benefit of substantiating research. Conclusions drawn from usage data fail to take into account critical social factors that may affect projections. And, perhaps most problematic, questions of funding and means are only occasionally addressed. All of this suggests that the role of public acceptance in the commercialization of technology is severely underestimated by the very experts who have the most at stake. In fact, realizing the opportunity they have labored to create requires public acceptance and demand – which in turn must be translated into the necessary means. New products, to succeed, must either meet an existing need or anticipate a latent one. In either case, experience with a broad range of products and services makes clear that commercial success is dynamic, requiring understanding of and interaction with the potential consumer from the earliest stages of research and development. Virtually by definition, R&D in commercial enterprises is largely customer­driven, giving strong consideration to practical application – and to market composition and demand. Not surprisingly, this kind of customer focus is second nature for consumer product companies. By definition they are directly involved with individual consumers; their business depends on the ability to anticipate and respond to rapidly shifting preferences and demands. Heavy industry takes far longer to respond to shifts in public sentiment, in part because interaction is less direct when the customer base is industrial, not individual. Even so, the process industries also respond to public demand – e.g., by devoting R&D and other resources to improving environmental performance. By contrast, research and development efforts in the academic and government sectors traditionally tend to focus on “pure” science, often with relatively little attention to practical application. The “customer” for these endeavors is unspecified, since no specific “end user” is necessarily involved. In the quest for capturing this highly mutable, erratic, and often nonrational creature called market demand, it is not uncommon for those in pursuit to fall prey to certain phenomena that seduce, mislead or otherwise interfere. As it relates to alternate energy sources, most available research suggests that generic demand can be considered a given. Few would argue that conventional sources will be adequate into the next century, even at conservative levels of projected usage and population growth. Even if they were, public demand in the industrialized world for environmental stewardship and resource conservation would, of itself, challenge the status quo. Both of these factors – increased usage and environmental awareness – create a favorable context in which alternative technologies can be considered, developed and promoted. Many proponents of various energy alternatives ­fusion, nuclear power, wireless power transmission (WPT) – find the evidence of generic demand irrestibily seductive. Bolstered with sheaves of usage data and predictive models, they frequently make the mistake of using generic demand as a reliable indicator of specific market for the technology they support. Generic demand for renewable energy resources, however, does not translate into support for a specific alternative. At best, it suggests a range of characteristics that alternate energy sources should demonstrate if they are to be considered viable marketplace contenders. As generic demand may create an illusion of support, data suggesting the need for energy can be similarly misleading. For one thing, “need” is often arguable. Studies attempting to determine and quantify need often fail to recognize its essentially subjective nature. In other words, need is in the eye of the needy. Demonstrable absence or limited supply of something – in this case, access to energy – does not necessarily indicate that the people under study share the surveyor’s conclusion that they need it. When need is deduced from the outside rather than documented from within, study results may imply a sense of urgency that is less than entirely valid, and potentially misleading as a result. The expectation is easily created that certain populations will naturally – and actively – support efforts to improve their access to energy resources – expectations that may or may not be realistic. Even when the need for energy resources is fully and objectively demonstrated, a market per se does not necessarily exist. This holds true regardless of the project or service in question, it is remarkable how many otherwise sophisticated business people fail to understand and act on it. For example, when the Cold War came to an end Eastern Europe became the new frontier for Western goods and services. Investment banks, consumer products companies, civil engineers, consultants of all kinds rushed to open offices and make deals – because they saw urgent need, pent-up demand, and a massive untapped market. Unfortunately, most of these marketeers were only partly right. Need for certain goods and services was indisputable; consumer demand was readily demonstrable. But in a great many cases no sustainable market has evolved, for the simple reason that “market” implies transaction, and transaction requires both the willingness and the capacity to pay. This does not mean to suggest that Eastern Europe does not have the potential to become a viable, robust market for a broad range of goods and services. What this experience does make clear, however, is that need and market are hardly synonymous, and that markets often need to be created before they can be captured. The concept of creating a market – as distinct from serving a preexisting one – has direct implications for those concerned with commercializing power from space. As with many large-scale innovations, technology has arguably outrun public awareness and acceptance. Further, the “customer” has yet to be clearly defined, with the result that marketing efforts necessarily lack focus. Finally, the technical community must recognize that it can ­ indeed, must – play an active and initiative role in bringing a viable market into being. Each of the components of market demand offers the technical community the opportunity to participate – and to shape the end result. In considering these components – need, safety, benefits, value, and means – technical experts should apply the same discipline and creativity that characterizes their research and development efforts. Table 2 summarizes market demand components and some specific actions that may help to actualize them. Need for space power should be more closely defined and documented. This involves probing energy markets more deeply and understanding the current strengths and limitations of existing technologies. It also means challenging existing projections concerning usage, and conventional wisdom concerning public acceptance. A concerted effort to consolidate, evaluate, and interpret existing research would be an invaluable first step toward a meaningful assessment of need. Moreover, as a second step, a focused needs assessment would help to define inherent benefits (social, monetary, or environmental) against competing technologies – from the customer’s point of view. As discussed in the following section, it is in this area that the technical community has thus far largely fallen short of the mark. The customer for space power remains ill-defined, with the result that marketing initiatives remain, understandably, unfocused. Safety of alternative technologies must be thoroughly demonstrated. In the case of(WPT) Wireless Power Transmission, public safety issues relate to health effects arising from both acute and chronic exposure. While the technical community for the most part agrees that WPT is essentially safe, there are no conclusive data concerning long-term effects on biota. Given the prevailing climate of extreme skepticism and close attention to environmental and health effects, it is reasonable to expect that until such data are compiled and assessed, WPT cannot win broad public acceptance – in the US, at least. This suggests strongly that the technical community should seek out opportunities to study and document the health effects of chronic, low-level microwave exposure. For example, point-to-point, terrestrial demonstration projects offer such an opportunity, and their design should integrate a health-effects component. Benefits of microwave power from space should be determined, proven and communicated. As suggested above, benefits are often in the eye of the beneficiary, and may not be the same as those perceived by the technical expert. To a significant extent, benefits are the flip­side of needs, and often can be most easily identified once needs are understood. However, the technical community need not wait for a conclusive, all-purpose needs assessment to begin identifying benefits. Because of their intimate knowledge of the underlying technology, technical experts are ideally situated. A sensible place to start is simply to create an omnibus list of every conceivable benefit to every possible constituency. This establishes the universe of benefits that can be refined to reflect a) levels of proof (actual and needed) and b) responsiveness to customer requirements. Value must be established against competing technologies. Particularly in the industrialized world, where mature alternatives exist, value in the sense of cost-efficiency is especially critical. WPT is at this point problematic from this perspective, given the infrastructure requirements involved in any large-scale application. Until and unless cost-efficiency can be improved, WPT will face an uphill battle for public acceptance. This suggests that the technical community would do well to focus on questions of efficiency, while at the same time attempting to quantify certain benefits. “Value” is a multidimensional concept, of which cost is a significant component – but not the only one. 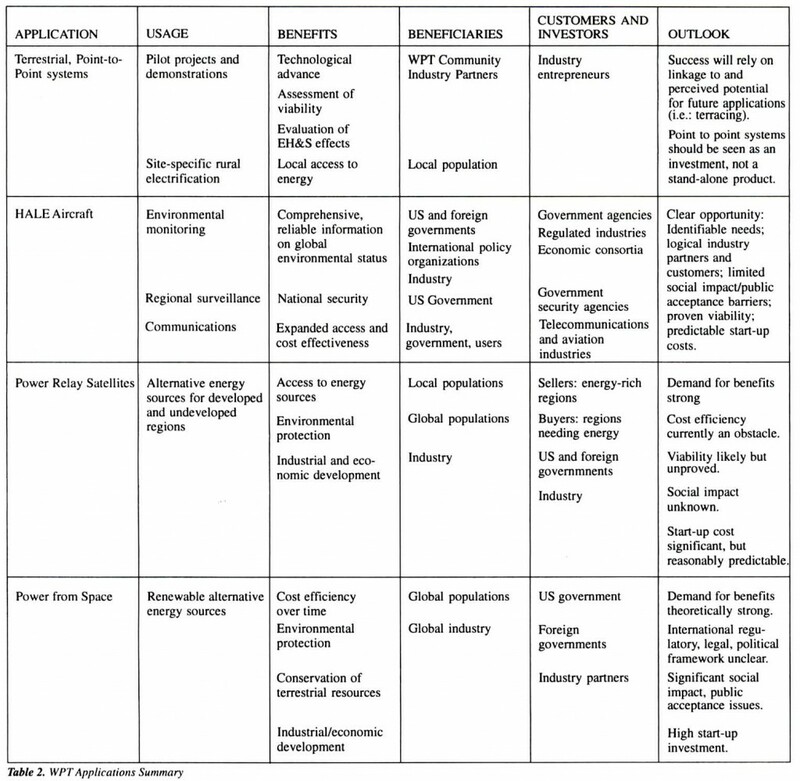 In assess WPT for its value, it may be that short­falls in cost efficiency can be balanced or out­weighed by other quantifiable benefits, such as Jong-term environmental stewardship. Means must be identified and generated to support commercialization. Technical experts can play a vital role in this process. In fact, it can be argued that the technical community must drive the process – because the phenomenon of spontaneous generation does not apply to start-up funding. The technical community as a whole has considerable experience in securing funding for academic and government research. This experience and skill set can – and should – be adapted and applied to obtaining financial support from the private sector for commercial purposes. Like academic funding, commercial support comes about through a combination of source research, proposal development against institutional requirements, personal and professional contacts, and raw luck. What can be very different is the perspective from which funding requests are evaluated, most notably in terms of financial return on investment. Another key difference is the extent to which discussions of project management and over­sight often include explicit treatment of financial controls. Any discussion of means must also address the fact that large-scale infrastructure projects often require the creation of consortia – entities (both commercial and government) with a shared interest in a certain result. Technical experts should actively seek opportunities not just to identify interest parties, but to bring them together. As the above discussion suggests, the marketing of microwave power to date has been somewhat fragmented. One reason for this lack of definition is that, in the case of space power and WPT, the customer (i.e., the purchaser) may be altogether different from the direct beneficiary (i.e., the end user). Table 2, which summarizes the relative “market maturity” of various WPT applications, defines customers as those entities making a purchase or investment.1 Obviously, no one invests with no expectation of some form of return; however, in some cases the return is indirect. A beneficiary, on the other hand, is the entity that directly reaps inherent benefits from a purchase or investment. Selling microwave power from space in the industrialized world means competing against mature technologies that have been proven in application. This requires defining the benefits of space power in such a way that it is seen as a viable, desirable alternative to conventional energy sources. These benefits might include environmental performance and resource conservation. In developing nations, the issue is not displacement of an established precursor, but of filling a vacuum. This means the market – and thus the marketing effort – is inherently very different. For example, developing nations need greater access to energy resources, and would clearly benefit, but their capacity to provide funding may be severely limited. In such a case, third parties (government and/or private industry) with an interest in expediting industrial development would be potential customers. because they would directly invest – even though the benefit they derive is indirect. This distinction is important for the technical community in that it helps point the way towards creating a market. The customer/beneficiary dynamic is mutually influential. At the same time, the needs and concerns of each side of the equation differ and must be analyzed ­ and then reconciled. While benefits such as these may be difficult to quantify precisely, there is no question that they have value to a funding entity or customer. Defining that value in a meaningful way requires understanding the customer well enough to reflect its business priorities, both financial and strategic. As the foregoing suggests, WPT commercialization cannot occur in a vacuum, or in the laboratory.2 Commercialization of a technology, unlike its underlying R&D, is effectively a public process, dependent on business partners, advocates, and the consumer. As we attempt to commercialize WPT, we must redirect our thinking accordingly. At every stage we must be highly sensitive to social impact and public acceptance issues. We must recognize that, as with any technology, successful commercialization of WPT depends first on public acceptance, which then can be parlayed into market demand. Without acceptance, there will be no demand; and, in a free-market economy, without demand there can be no product. In short, broad public acceptance is a minimum requirement for successful commercial application. The technical and scientific communities must recognize that the problem of public resistance is one for which they have some accountability, and in which they can, and must, play a role in resolving. Some barriers to public acceptance arise within the WPT community itself. Highly focused concentration on a technical problem or solution often yields breakthrough innovation, but sometimes those engaged in it tend to forget the broader context of their efforts. The focus then becomes the specific technical issue itself, independent of the underlying business or societal problem the technology will help to resolve. There are other barriers to public acceptance that are inherent in the outside world. It is easy to forget that people are, for the most part, creatures of habit. Thus, simple inertia may be the greatest barrier to public acceptance of something new. This default to the status quo becomes greatly exacerbated when the something new in question is in itself complex, and its applications create debatable cost ­benefit tradeoffs. technical development, to address some of these concerns. 1) Recognize that public acceptance is the ultimate determinant of WPT’s commercial success or failure. This philosophy must inform the effort at every stage; if obstacles to acceptance cannot be overcome, the effort can only remain a theoretical exercise. These and other, similar subgroups can be viewed as “gatekeepers,” people and organizations whose views strongly influence popular opinion. Understanding their perspectives on WPT provides valuable intelligence that can help guide information efforts. 3) Probe the nature, scope, and origins of people’s concerns, and acknowledge their legitimacy. In addition, each potential application presents specific issues whose origins need to be understood. Whether these or other concerns are technologically valid or not, they must be taken seriously in that they create barriers to application. 4) Gather data that address these concerns. Data on health and safety risks and effects are critical to the acceptance of WPT in any application, especially those that will directly affect broad populations. Mechanisms for collecting and evaluating these data should be incorporated at every opportunity. In addition, opinion research will help identify other avenues for data collection that may not have been considered by the technical team, to complement ongoing technical research. 5) Identify and analyze user benefits. It is often very productive to list every end user benefit the technical team can think of. Some may be less obvious than others. For example, will this application create jobs? A new industry? Will it result in less solid waste? Will it improve our environment or quality of life? This exercise yields valuable information about the process, while forcing the team to think about it from the customer’s point of view. 6) Identify potential allies and adversaries. Opinion forms as the result of multiple information sources, and third-party opinion (in part because it is seen as disinterested) is often particularly influential. “Opinion leaders” may be academics, business executives, scientific experts, elected officials, regulators, consumer advocates, reporters, or others who act as gatekeepers to a broader population. Knowing who they are, and what they think, as regards WPT in general and each application in specific, creates an important advantage. 7) Devise a long-term strategy for maintaining public interest and ongoing interaction with potential customers. – raise the baseline of general awareness of WPT. While this may raise controversy in the short term, it is preferable to begin dealing with it earlier in the process than retroactively. – broaden the circle of knowledge to include other, related scientific disciplines and business interests; where possible without compromising trade secrets, seek out opportunities for third-party reviews of R&D to date. – involve gatekeepers in the process to gain support and reinforce credibility. – identify and stress benefits to the end user, in addition to technical features. – affirmatively address health and safety issues. – maintain strong relations with elected and appointed officials and the news media: trade, technical, financial, and general. 8) Remember that communications is a process, not an event. Components such as these and others should be seen as part of a continuum, whose goal is to establish and maintain relationships that will be critical to WPT commercialization. The process of gaining widespread public acceptance takes time and continuity of effort under almost any circumstances; for a technology as under-recognized as WPT, this holds doubly true. Commercialization of WPT – in whatever application – requires consensus and critical mass among the technical and scientific communities. The scale is too great and the stakes are too high; no single individual or institution can go it alone. Moreover, the world is too small and the funding too scarce to permit fragmentation and dissent. If we are to participate in decisions concerning energy resources, capital investment, and industrial policy, we must speak with a single voice. It is up to us to find that voice and use it; elected officials, policy-makers, and captains of industry will not come to us. The WPT community, embracing as it does a disparate range of industry, academic, and government experts, has yet to achieve the consensus needed to establish a place at the table. Achieving this means that the WPT community must do two things: First, we must break down our internecine barriers and overcome the habit of R&D parochialism in the interest of achieving a common goal. Instead of focusing on and defending our different perspectives, we must identify and put forward a position that reflects those aspects of WPT development in which we can find agreement. Second, we must venture outside our small, highly concentrated world and reach out to others who share an interest and an investment in the development of energy alternatives. Commercialization cannot occur in a laboratory; even if we are united in our purpose we cannot do it alone. We must actively forge alliances with responsible environmental groups, citizens’ coalitions, and economic and industrial policy experts, in short, with people who can act as advocates on behalf of WPT. Just as technological advances require a critical mass of consensus among technical experts, commercializing those advances requires us to agree on common goals, and to pursue them as a unified force. If we can do this, what lies ahead will not be easy – many obstacles remain, and they are very real. But so are the potential rewards. If we are ready to meet this challenge, our work is cut out for us. 1. Woodell, Mary I. and Schupp, B.W., “The Role of Pilot Projects and Public Acceptance in Developing Wireless Power Transmission as an Enabling Technology for Space Solar Power Systems,” International Microwave Power Institute Conference 1994. 2. Woodell, Mary I., “Commercialization of Wireless Power Transmission: The Proof is in the Public,” WPT 93: The Commercial Potential, San Antonio, TX, February 1993. SSI has been fortunate to have Jay Thomas as an intern for the past three years. Jay came to us as a Sophomore in High School. As part of his internship he has been printing out and cataloguing Dr. O’Neill’s correspondence, writings and technical papers from the original Apple II diskettes for inclusion in the Gerard K. O’ Neill Memorial Library. Jay was also responsible for setting SSI up with e-mail and is in charge of the care of the system. Many of you may have met Jay since he has attended the past two SSI Conferences. Jay lives in Princeton with his parents and three brothers and one sister. He will attend college in the Fall. We appreciate all his efforts on SSI’s behalf. Is life on Earth under a death sentence from space? In the first book for the general reader that presents the full range of scientific evidence for the past and possibly future dangers, noted planetologist and impact ­crater expert, John S. Lewis, shows us the unmistakable evidence – from space probe flybys of the planets to the scars on our own Earth- of cataclysmic comet and asteroid impacts. By comparing what we know about the Earth’s geology and paleontology with the images of the other planets and moons in our solar system, Lewis makes the strongest case yet for sudden, dramatic extinctions and assesses the risks to planet Earth. John S. Lewis is Co-Director of the NASA/University of Arizona Space Engineering Research Center, Commissioner of the Arizona State Space Agency, and an SSI Director. SSI Members and Senior Associates can order Dr. Lewis’s book at a 10% discount. The special price is $22.00 plus $4.00 postage within the US. The Space Studies Institute is a non-profit, international, research and educational organization. Founded in 1977, it is dedicated to opening the high frontier of space. SSI’s goals include using the material wealth and solar energy of space to improve the human condition both for those who live on Earth and those who live in space, and to build Earth-like habitats in space to expand the ecological range of humanity throughout the solar system and ultimately, perhaps, throughout the galaxy. SSI’s Corporate Membership program offers access to SSI’s broad base of technical advisors access to a resume pool, and access to exhibit space at the biennial SSI Conference on Space Manufacturing. Research partnerships are encouraged. Payments can be made annually, semi-annually, quarterly, or monthly. Each Senior Associate receives a number with his or her rank, indicating when he or she joined the program. For example, the next person to join could be come Fellow 368, or Distinguished Colleague 126. Each Senior Associate receives a certificate, signed by SSI’s president, as a permanent record that he or she was one of the first people who gave critical support to the High Frontier. The names of the Senior Associates will also be permanently maintained by SSI to provide historians with the names of early High Frontier supporters. SSI Membership is open to individuals worldwide. All members receive the Institute newsletter, which is published quarterly and keeps all SSI members abreast of SSI research, an SSI membership card and decal. Membership fee: Regular $25.00; Senior Citizen or Student $15.00; non-US addresses, please add $10.00. Mr. Christopher J. Faranetta, NPO Energia, Ltd.
Mr. Jeffrey Manber, NPO Energia, Ltd.
Mr. Burt Rutan, Scaled Composites, Inc.
Commercial Space Transportation by Walter Kistler will be featured as the newly designed (updated from May, 95) fleet of fully reusable rocketships are announced. Lunar Prospector: progress on this mission will be featured in an article detailing Lockheed Martin’s progress on the construction of the probe. 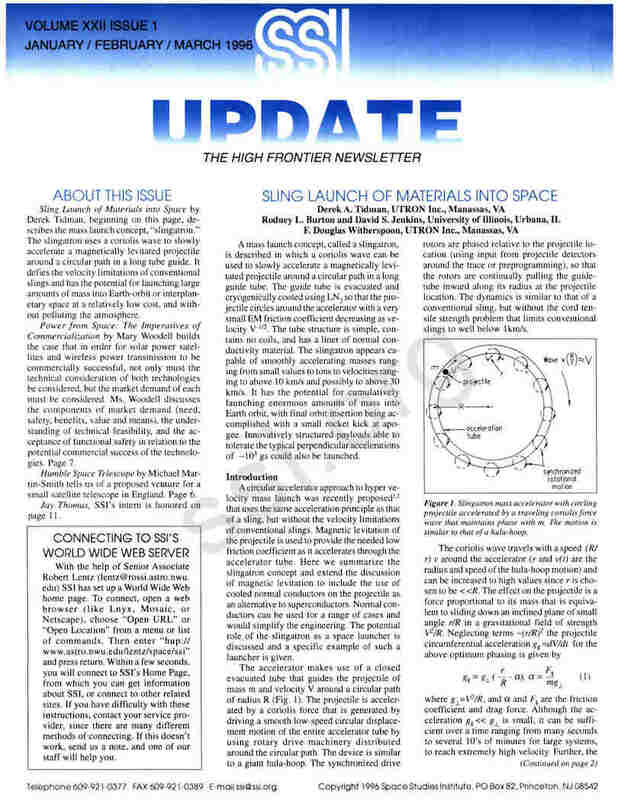 Minimizing the Initial Space Manufacturing Base by SSI Senior Advisor, Steven Vetter will be featured in the next issue. SKIT, a Progress Report will be featured in the second part of 1996 as the SSI researchers’ report on the progress of the SKIT robot.